My MacBook Pro spent a couple of days this week hanging out with the service folks at Nashville’s MacAuthority. The less-than year-old (so therefore in warranty) MacBook needed its trackpad replaced. It seemed odd to me that something so new would need to be replaced. It was only then, months — perhaps years — after using the current model trackpad, that I, in a classic “duh” moment, realized I have been “clicking” my trackpad when I should have been “tapping” it hundreds, perhaps thousands, of times a week. Now, the difference in clicking and tapping may not sound like a big deal, but “tapping” is electronic and “clicking” is mechanical. The life time of a trackpad is probably related to a specific number of “clicks” while the number of “taps” is likely many times that. After getting my MacBook home and diving into the whole “tapping thing” at a much deeper level, I realized that, had they chosen to, the MacAuthority service people could have pulled a Steve Jobs on me and said, “Hey, you voided the warranty by clicking it too much.”* But, in this case, they honored my warranty and didn’t charge me for the repair. Even though they’ll fix it if “clicking” is the way I want to control it rather than tapping, I’m working on tapping more and clicking less. But old user-interactions are hard to give up. Even when Apple (as they do in the “systems preference” trackpad controller) bakes how-to video into the interface for setting ones preferences (which is, by the way, a rather impressive user-aid), I imagine there are lots of people who use “click and drag” commands rather than the “tap-tap/hold-drag-tap” method. *To knee-jerks: That is a joke. It is a reference to Steve Jobs saying “you’re holding it wrong” and Apple saying that jail-breaking an iPhone voids the warranty. It’s just a joke, and, come to think of it, a very lame one. I apologize to fanboys that I even included it. The web is a place. This blog is me. When you stop thinking of the web as merely a medium and think of it also as a place, you’ll better understand what’s taking place. You need to realize that a blog and Twitter and Flickr and YouTube can be more than mere publishing platforms, they can become platforms for personal expression and observation and eye-witness and opinion and conversation. While the web provides the potential for professional and gifted creators to create in new ways and for new audiences, it also provides all of us with the potential to be just who we are to whomever we want to be. When you finally come to realize that what you’re capable of doing on the web transcends writing or blogging or tweeting, but has the potential of being who you are, you’ll get it — or, more accurately, you’ll get what it is for you. And yes, I made it all the way to the bottom of this post without once using the word existentialism. Asking the wrong question: Will Tablets Close the Book on e-Readers? Whenever it comes to any technology, in the long run, the new will always replace the old. But as John Maynard Keynes said, “In the long run, we are all dead.” So it’s always a matter of when and not if. Timing is everything. I believe eBook readers will be around for a long time — if their price drops to the price of, say, a Gillette razor. For me, the iPad replaced an eBook reader instantly. (In reality, I guess I made that decision two years before such a thing as the iPad existed.) However, as I’ve written about before, Amazon’s Kindle apps for the iPad and iPhone are how I read most books. In the future, there will be all sorts of devices that will replace the way we do things today. You’ll wear some of them like glasses. Some may be handheld or “pico” projection devices that will be controlled by voice or hand gestures. Some day, you may even wear contact lenses with built-in circuits and LEDs — correcting vision and providing an interface to all known media at the same time. In the future, our choices won’t be between tablet devices and ebook readers. Geez, what a boring future that would be. Later: I’ve been asked, “So what is the right answer?” if @Wharton asked the wrong one. I think my point is, there is no question. Things always change. And, alas and clichéish, they stay the same. 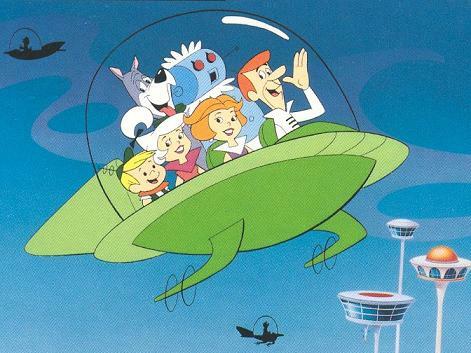 But perhaps the real question is: Will flying cars do away with non-flying cars?